This document is a supplement to the President’s 2017 Budget request submitted to Congress on February 9, 2016, and serves as the Annual Report for the National Nanotechnology Initiative called for under the provisions of the 21st Century Nanotechnology Research and Development Act of 2003 (Public Law 108-153, 15 USC §7501). The report also addresses the requirement for Department of Defense reporting on its nanotechnology investments, per 10 USC §2358. 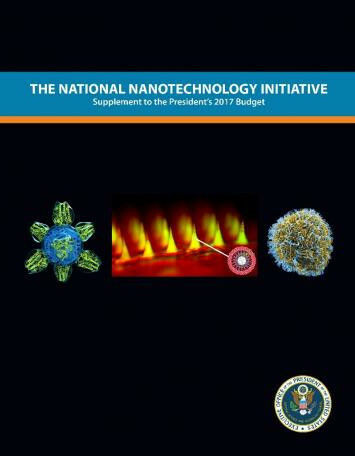 The President’s 2017 Budget provides $1.4 billion for the NNI, with a cumulative total of nearly $24 billion since the inception of the NNI in 2001 (including the 2017 request), affirming the important role that nanotechnology continues to play in the Administration’s innovation agenda. The President’s 2017 Budget supports nanoscale science, engineering, and technology R&D at 11 agencies. Another 9 agencies have nanotechnology-related mission interests or regulatory responsibilities. (See this graph for funding trends since the inception of the NNI; see the Acronyms page for agency abbreviations.) The NNI Supplement to the President’s 2017 Budget documents progress of these NNI participating agencies in addressing the goals and objectives of the NNI. As called for in the 21st Century Nanotechnology Research and Development Act, NNI investments are categorized by Program Component Area (PCA). The PCA breakdown for the 2017 Budget can be seen in the pie chart on the right. Over the past year, the NNI participating agencies, the White House Office of Science and Technology Policy (OSTP), and the National Nanotechnology Coordination Office (NNCO) have been charting the future directions of the NNI, including putting greater focus on promoting commercialization and increasing education and outreach efforts to the broader nanotechnology community. As part of this effort, and in keeping with recommendations from the 2014 review of the NNI by the President’s Council of Advisors for Science and Technology, the NNI has been working to establish Nanotechnology-Inspired Grand Challenges, ambitious but achievable goals that will harness nanotechnology to solve National or global problems and that have the potential to capture the public’s imagination. Based upon inputs from NNI agencies and the broader community, the first Nanotechnology-Inspired Grand Challenge (for future computing) was announced by OSTP on October 20, 2015, calling for a collaborative effort to “create a new type of computer that can proactively interpret and learn from data, solve unfamiliar problems using what it has learned, and operate with the energy efficiency of the human brain.” This Grand Challenge has generated broad interest within the nanotechnology community—not only NNI agencies, but also industry, technical societies, and private foundations—and planning is underway to address how the agencies and the community will work together to achieve this goal. Topics for additional Nanotechnology-Inspired Grand Challenges are under review.